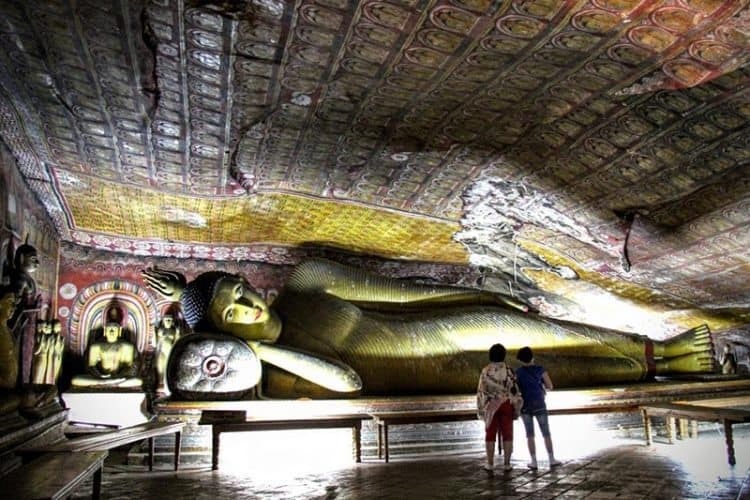 The Maha Alut Viharaya or Cave of Great New Temple at the Dambulla Cave Temple was constructed by King Kirti Sri Rajasinha who lived from 1747-1782 AD and features this 30-foot long reclining Buddha. Kim Schneider photos. "What is your name?" is the question posed by a few dozen gleaming school girls to some Americans also visiting a popular Sri Lankan temple in Colombo. robe of bright orange. We were more an attraction than even the worship room's 30-foot high Buddha or a relic chamber stocked with an unusual combination of ancient scrolls, gold bracelets and a plastic yellow Pikachu. 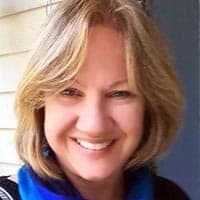 As school children on field trip waft in wearing crisp white uniforms, striped ties and braids, one leans closely and whispers almost reverentially: “What is your name?” Others repeat the question or the answers—Kim, Karl, Kevin—as if trying to memorize the encounter with the unusual strangers. By instinct, I give one gleaming girl a high five, and soon all those in the long line of gigglers are slapping my hand like in a team congratulations line. Luckily, no teachers are glaring and even the monk is still smiling. 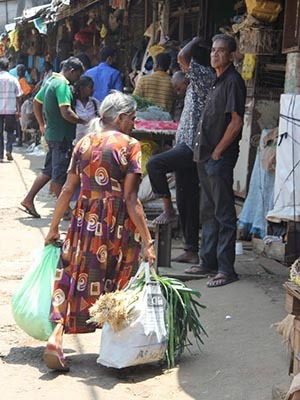 For three decades, ending in 2009, a Civil War between the majority Sinhalese and the Tamil minority to the north virtually cut off this independent island nation once known by its British colonial name Ceylon from foreign travel. Recognize me? Everyone seems to want to capture the experience of a sunset at Galle Face in Colombo, the capitol of Sri Lanka. The novelty of seeing Westerners, we at first suspect, explains the friendly welcome and wide-eyed joy. Later, we suspect the culture of radical hospitality in this land of geographic contrast and exotic traditions. En route from our guest house to the temple, we had to veer around the snake charmer sitting cross-legged on the lakefront path. He shook one fist like a rattle as the reptile in the other rose from the wicker basket. 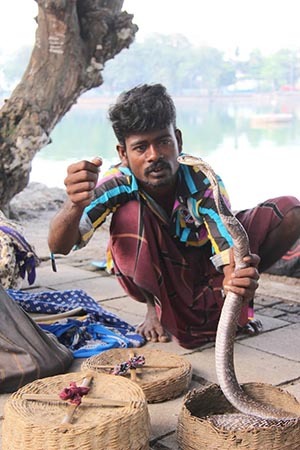 A snake charmer sits along the path around Beira Lake in Sri Lanka's capitol of Colombo. The dancing cobra was no more surprising, though, than the groom we at first assumed to be a prince as he stood in the temple courtyard in a wine-colored cloak embroidered with a gold dragon and spear and gilded tricorn hat. The bride was every bit the princess in embroidered silk and matching headdress. It was a day lucky for marriage throughout the country, a man who collects the small entry fee at the gate explained, and thus for us as wedding parties in royal garb mingle in the temple courtyard as they awaited a monastic blessing or party under the tangled roots of the Bodhi tree. I cornered a monk with twinkly eyes and basic knowledge of English to ask about the traditions and then (while I had him there) the secret to a happy life. When more children file past and I mentioned how I'd love to come back to teach, he gleams like a teacher whose pupil just had that lightbulb moment. “That's generosity!” he exclaimed. Stocking up at the Colombo's Pettah outdoor market. For many travelers, Colombo is more a launching point toward the country's highlands or golden beaches than a destination. But leave time to explore the temple, the elegant tea shops or the gritty Pettah market. Once a target of bombings, it's now a peaceful though bustling alley in which workers load heavy bags filled with bananas into tuk tuks or offer tastes of fragrant basil. Book an Airbnb, as we did, and you'll likely have an instant friend. Our host welcomed us with a local beer, an invite to a cricket match and his cell number—in case we get lost, had questions and needed a ride or ayurvedic massage (his avocation). Despite a light drizzle, we took his advice and went to Galle Face for sunset. Food stalls line a small cliff at the popular open space along the Indian Ocean, and the scent of spicy curries waft from open-air stovetops. We sampled dried coconut, wrapped like sushi, scented with cinnamon and dyed in the colors of the lotus leaves so popular as temple offerings and watched children leap and play amid bubbles and colorful kites. A young man inexplicably handed my husband a tiny sapphire--”a gift, he said,” and walked away. As the sky opened to a vibrant red glow, we asked a young family if we could snap their picture. They smiled broadly as they posed, then insisted we switch places so they can take our photo. On a day lucky for weddings, this royal-looking wedding party poses for photographs at a temple annex that floats in Colombo's Beira Lake. 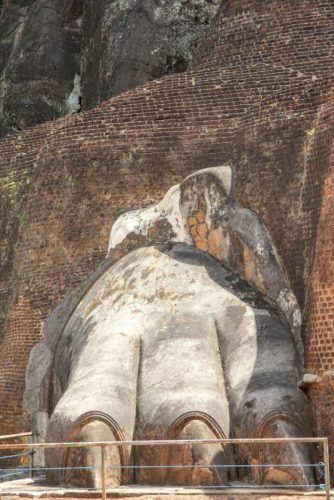 This rock "paw" is one visit-worthy section of a climb up Sigiriya (or lion's) rock, a UNESCO heritage site. Mountain vistas, exotic temples and legends await as you head inland—in our case in rental van we've opted to drive ourselves—toward the country's middle, an area known as the Cultural Triangle. Travel by car or train, and you pass tea plantations, spice gardens, misty lakes and innumerable Buddhas en route to Kandy, our chosen base for exploring four of the country's six UNESCO World Heritage sites. Climbing Sigiriya or “lion's rock” is a tourist must-do, if only for the “they must have made this up” tale of the prince who built a palace atop this mountain rock after he killed his father and hid out from his brother—walling the place off with a moat guarded by lions. Frescoes near the top feature bare-breasted women thought to have been the king's consorts—perhaps a bit scandalous for the monks who took over when the king left. I felt like a queen myself when two swarthy attendants appeared out of nowhere and started lifting under my arms, pulling me off my feet and up the rocky steps. But I decided to go it alone when one of my friends noted the service is not likely free. Bring water (it's hot here) and leave time to linger over the panorama viewed from the palace ruins at the top. Sunset is especially beautiful from the nearby Dambulla Cave Temple, a pilgrimage site for 22 centuries for the paintings, which are as bright and intricate as Persian rugs that cover ceilings of caves housing statues of Buddhas, Sri Lankan kings and various gods. The cultural triangle is completed by Kandy's Temple of the Tooth, where live elephants often lead ceremonies and on our day, visitors lined up with offerings of lotus flowers as a golden panel opened to drumming and chants to reveal a container holding what's believed to be one of Buddha's teeth. 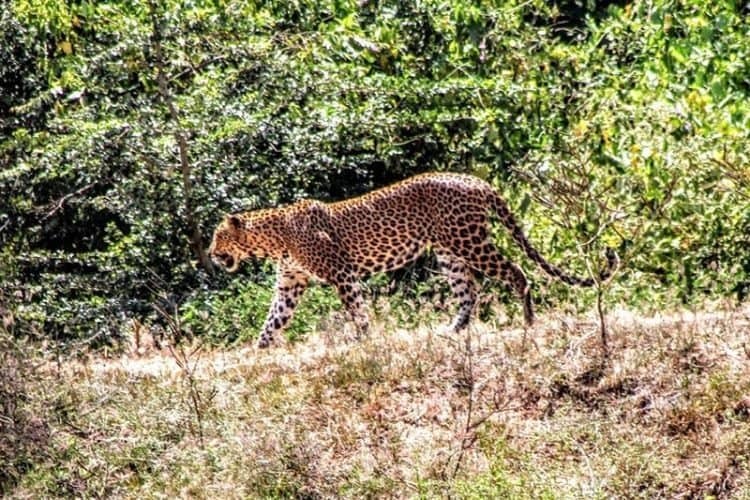 Many make the pilgrimage to Sri Lanka and its Yala National Park for just the chance to spot the rare Sri Lankan leopard. Yala holds the world's largest concentration of the endangered creature. A drive south to the coast led to the trip's pinnacle stop, Yala National Park, part of a large refuge system that preserves 13 percent of the island for wildlife. This park, along the southern coast, is home to the world's largest concentration of leopards, though they're still endangered—and much more. The Ruddy Mongoose of Sri Lanka will win no beauty pageants, but a sighting's still a thrill while on safari at Yala or or of the country's many other national parks. Our safari driver picked us up well before dawn, the most active time in the park for wildlife. In a short span, we spotted a painted stork, a green bee eater, a black-headed ibis and a crested serpent eagle. A rusty mongoose glared up from the dusty road with its cool but creepy red eyes, and in one of many elephant sightings, we watched for several minutes as a mama and her baby sip together from a spring. As if on cue, a leopard loped down the trail with the grace of a runway model. The six of us vied for the best camera view as the cat climbed a tree and waited for its lunch of water buffalo or spotted deer and we believed the driver when he tells us how lucky we just were. Our luck continued back at the lodge, where the director of a local economic development project sent multiple three-wheeled taxis to pick us up for dinner. We'd connected through a Facebook pottery group, and he had insisted that he treat us to dinner. He didn't mention that we'd be greeted by the 20 women who spent the day preparing a table full of curries and a bag each of pottery gifts, women who asked shyly to pose for photos with us and also sought our thoughts on how to make their artisan crafts more attractive to tourists. Egg hoppers, a thin pancake-style treat that may become particularly addictive. After the first, expect that finding them (and they're generally only served in morning and sell out quickly) will become a pilgrimage. Morning brought a feast of egg hoppers, the addictive Sri Lankan pancake that ferments overnight and tastes a bit like sourdough. Heaping bowls of rice and curries followed. We were almost reluctant to leave for Galle, another heritage site, but find more welcome happenstance once we arrive in and around the walled city. We added this itinerary stop to see a blue whale, the largest creature on earth, on our day-long boat tour. We didn't. But on an afternoon swim, we discovered that the rocks moving near our feet are actually massive sea turtles. They swam in the shallows near us as we snorkeled a magical afternoon away, only later learning that Sri Lanka was once called Serendip and the word from which the term “serendipity” stems. The beauty and ecosystem diversity of Sri Lanka's central highlands--home to the country's famed tea plantations--is one reason the landscape itself was named a UNESCO heritage site. There was time for just one more sunset in Colombo, about an hour's drive north, before our midnight flight, and my friend and I were drawn to a mass of school children dancing at the other side of the square. But then she joined in, taking one girl's hand and I another, and we twirled. Kim Schneider explores the world from her home base in Traverse City, Michigan's wine and orchard country. Follow her travel visuals in real time on Instagram, @travelingcoachkim. Hi Kim, Nice post. This post perfectly explained about culture and people of the Sri-Lanka. A travel is perfect when we connect with local peoples of that particular place.